Thanks to school subjects, television, movies and books, everyone knows that there are many kinds of dinosaurs in existence several millions of years ago. But what were seen in the movies and television are just quite a few of the numerous dinosaurs that actually existed. How many types of dinosaurs were there exactly? Scientists have uncovered approximately 700 species of dinosaurs, but less than half of these species do not have enough evidence to support the fact that they are unique and separate dinosaur species. The actual number of dinosaur species that have enough data to support their uniqueness is around 300. The following are ways the dinosaurs are being categorized. The Mesozoic Era of the planet’s history is called the Age of Dinosaurs because it is during this period where most of the dinosaurs were said to have lived. It ranges from about 248 million years ago to 65 million years ago. This era is divided into 3 periods: the Triassic period, the Jurassic period and the Cretacious period. These periods are also divided into 3 sub-periods each: the early, the middle and the late periods. This timeline is a major tool in categorizing dinosaurs because it differentiates different species by the period wherein they lived. Dinosaurs were not really abundant during the beginning and the middle of the Triassic period. This is the period after the largest extinction ever known by science where 95% of the planet’s animal species died out. By the end of this period, another extinction occurred which allowed dinosaurs to take dominance. They started to become abundant and diverse heading into the Jurassic period, where the most number of species lived. All kinds of dinosaurs existed in this period including bird-like, fish-like and land-based dinosaurs such as the allosaurus, the diplodocus and the apatosaurus. The height of the age of the dinosaurs occurred in the Cretaceous period where such dinosaurs as the gigantosaurus, the triceratops and the most famous dinosaur of them all, the Tyrannosaurus rex existed. The diversity in the dinosaur species boomed in this period along with the flourishing species of mammals and plants. At the end of the Cretaceous period, an extinciton occurred which wiped out the dinosaurs, leaving the mammals to take over. Dinosaurs are also categorized by size and by body type. They are classified into species, genus, family and order based on these physical characteristics. Two major groups that emerge from this type of classification system are the ornithischia and the saurischia. The former means “bird-hipped" while the latter means “lizard-hipped". Examples of dinosaurs in the ornithischia classification are the ankylosaur, the pachycephalosaur and the stegosaur. Examples of saurischia dinosaurs include the massospondylus, the riojasaurus and the plateosaurus. These two classifications have a number of sub-classifications to describe dinosaurs in a more specific way. Another way of classifying dinosaurs is through their diet. Herbivores ate plants, carnivores ate meat, and omnivores ate both plants and meat. No matter how many types of dinosaurs were there, the easiest way of determining them is through their food preference. 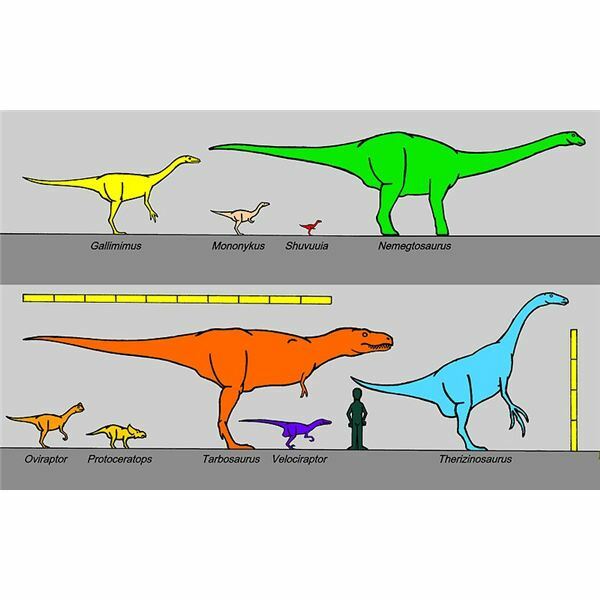 USGS: How Many Types of Dinosaurs are Known?